If you are bullied in your town, grab your phone and call MMA fighter Mayhem Miller and he'll beat your enemies down. This is the concept of the reality show from MTV called the Bully Beatdown. The new season premieres tonight. 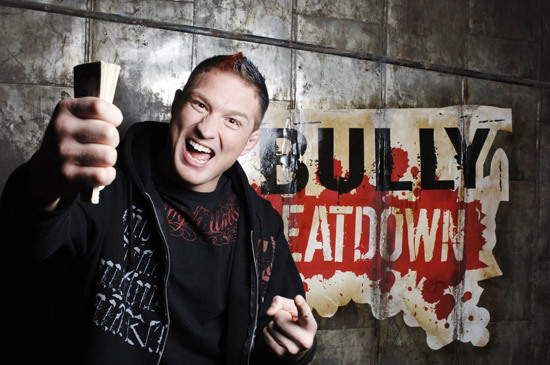 Jason “Mayhem” Miller, Strikeforce and DREAM fighter, returns on the MTV scene for the third season of his show ‘Bully Beatdown’ on MTV tonight. The show debited in 2009 and become a hit since then. It shows bully victims enacting revenge on their tormentors with the help of MMA fighters. It airs on MTV at 11 pm during Thursdays. Producers promised changes this season which includes longer rounds, smaller headgears and female bullies. A bully victims contacts Miller for help. Then, the MMA fighter faces the bully inside the octagon. If the bully survives the round of kickboxing and grappling, bully wins cash prizes. Fighters who appeared on the previous seasons include former Strikeforce champion Jake Shields, Bellator champ Eddie Alvarez, Michael Westbrook, Tony Bonello, Conor Heun, Jon Murphy and Thomas Denny. Jeremy Horn, Tyron Woodley, Alvarez, Joe Riggs, Nick Gaston, Michelle Waterson, Bobby Green, and even Miller himself dish out punishment this season. Veteran referee “Big” John McCarthy serves as the main official. The show is produced by Mark Burnett. It was noted as No.1 on ratings among male viewers from 12 years old to 32. There needs to be more research on your viewing demographics, there are those of us in the 55+ age group who love Jason and his show Bully Beatdown and that includes females in the age group as well. We were getting worried that the show had been cancelled. We are going to have a huge old freaks party to rival Superbowl home parties when the show debuts! R.Potter in Washington State a BLUE STATE – yes, even us liberals love seeing asses kicked and arrogant, stupid bullies beatdown. THANKS Mayhem.